I’ve blogged elsewhere about the hostility engendered by the vocabulary chosen to discuss the medium of pastel, and how language itself may be used to undermine an art that was so highly prized during the eighteenth century. In this post I will examine the language implicit and explicit in the coverage of pastels made before 1800 in the Burlington Magazine, with the aim of investigating how this journal participated in the formation of these attitudes. I shall not attempt to ‘defend’ pastels or their value relative to other media, nor to explain their general neglect – apart from a brief revival a hundred years ago, and a more sustained interest today among American art museums as these topics are extensively treated in my website Pastels & pastellists. I’ve reviewed the occurrences of the word ‘pastel’ not merely in the few dozen articles devoted to the medium but also wherever the word has appeared during the period 1903–2008. A full-text search yields around 1500 hits, but most of these can be disregarded, either because they are simply phrases such as ‘pastel-coloured’; or because they refer to artists working later than the period in which I am interested. Volume 1, number 1 (March 1903, p.134) contains two references to pastels, both in an article on ‘New acquisitions’ at British Museum: ‘The English drawings include a beautiful pastel portrait by Sir Peter Lely, Sir Joshua’s portrait, also in pastel, of his great-niece Theophila Gwatkin….’ This is perhaps not the greatest start, as neither work was correctly described: the Reynolds sheet is not a pastel, while, unfortunately for the reviewer, the other is no longer attributed to Lely. The 1903 comment, however, reflects the state of art history at the time as a young discipline still in fieri: not only were attributions in a state of flux and subject to heated debate, but also many historical painting techniques were not fully understood. A total of some 300 pastels made before 1800 by about 90 artists are mentioned. As well as casual references, they include a few dozen monographic articles devoted to individual artists (the majority reviews) and a similar number of pastels reproduced in other contexts, e.g. museum acquisitions or advertisements. The analysis is skewed by a handful of articles: reviews of French exhibitions in 1927 and 1997; several advertorials inserted by the Cailleux firm; and the checklist of pictures in National Trust houses, each of which contain many names otherwise completely absent from the journal. A clear picture nevertheless emerges: the leaders are La Tour, Liotard and Rosalba (each with about 9% of the mentions), followed by Perronneau, Russell, Hamilton, Chardin, Hoare and Cotes. These eight familiar names collectively represent about half the total mentions. Are these the ‘best’ pastellists, or merely those that attracted most interest in exhibitions and the saleroom? Those who believe that the market determines value as well as price may be struck by the pretty close match between these names and the list I made of works sold at auction for $100,000 or more. Academic interest is slightly different: artists such as Greuze and Vigée Le Brun, always popular Ph.D. subjects, do figure in the next tier, but their pastels are seldom the focus of either theses or Burlington articles. More interesting perhaps is who is not mentioned at all. Lundberg, for example, is mentioned four times, but three of these are simply references to his portrait of Boucher. Lenoir is mentioned once only, in the context of a 1908 Paris exhibition which included his pastel of the actor Lekain as Orosmane (July 1908, p. 233), a work that the Louvre bought in December 2013. (illustrated here). The list of French pastellists of similar merit who are omitted entirely or nearly so is too long to repeat here: it runs from Allais and Bernard to Valade and Vivien. 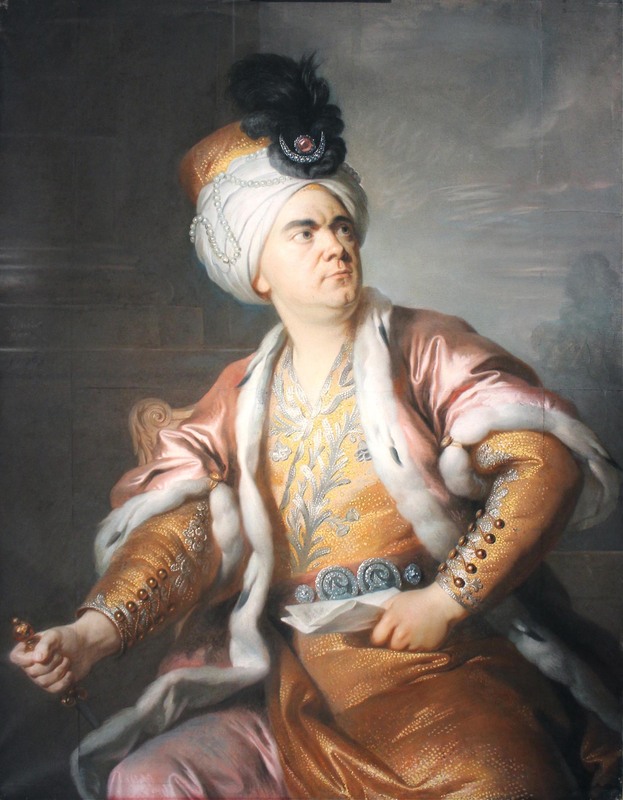 But perhaps the most significant absences, as they hint towards a wider historiographic bias, are the pastellists from outside Britain, France and Italy: the Germans Schröder, Tischbein, J. H. Schmidt and Darbes are omitted, while Mengs as pastellist is hardly mentioned. Juul (Danish), Roslin (Swedish) and Troost (Dutch) are also neglected. Lionel Cust, in his review of Robert Rene Meyer-Sée’s English pastels, concluded (September 1911, p. 361): ‘The book…is a charming picture-book of pretty women, even if the portraits selected are but moderate specimens of a second-rate art, while some show many of the repellent exaggerations of the pseudo-classical, namby-pamby style which was unfortunately so much in vogue.’ Cust objected to the fashionable, sensationalist and populist form of art criticism expounded by Sée and other writers connected with The Connoisseur magazine. Many of them also dealt in pastels, and the taint has stuck. Unfortunately Sée’s poor book, filled with bad art, was not displaced by better ones. The Burlington cannot be criticised for not reviewing what was never written, and there are limits to its power and responsibility when the principal aim is to assess what is presented, on paper or on the wall. Thus one sympathises with the unfortunate critic faced with a monographic exhibition on Daniel Gardner. Keith Roberts (July 1972, p. 491) could only conclude ‘that while one, two, even at a stretch half a dozen portraits by Gardner are tolerable, an exhibition of ninety-six items is not to be borne. We may have been prepared to admit that as an artist he had a wart or two; but at Kenwood it was more like indecent exposure.’ One notes that a major John Russell exhibition, planned for a few years later, never in fact took place. Nevertheless, today, a few dealers continue to promote Gardner as a major name, while the Metropolitan Museum of Art saw fit to include two of his works among the 44 making up their major 2011 pastel exhibition. Perronneau was not overlooked completely, being the subject of a two-part monographic study in 1920 by the doyen of pastel studies, Paul Ratouis de Limay. Unfortunately, many of the remaining mentions are to the National Gallery’s controversial Girl with a Kitten, which D. S. MacColl, in his review of Ratouis de Limay’s monograph (July 1924, p. 30), lamented as ‘a feeble, or perhaps enfeebled example, and no more represents him than one of Tennyson’s ‘Songs of the Wrens’ would stand for that poet in a French anthology of English verse. Better a vacant place than so misleading a specimen.’ A puzzling reference to Perronneau arose in the review of an exhibition in Bordeaux (December 1989, p. 869): ‘There were some twenty pastel portraits of Bordeaux association by the Parisian Perronneau, La Tour’s peripatetic younger rival, the best well up to Gainsborough.’ This observation will not be taken with equanimity by those who place Perronneau’s art at the summit of dix-huitième portraiture. They are a minority, and the market today is positioned as far to the other side of this debate, even if it was not always so. A small Gainsborough coloured chalk drawing sold last year for $2.4 million, ten times higher than Perronneau’s auction record in pastel. Criticism follows, or perhaps encourages, this market bias: on a simple full text search, Perronneau scores 114 compared with 2107 for Gainsborough; the two articles devoted to the French pastellist are outnumbered thirty times by monographic studies of the English painter in the Burlington’s pages. Pastels were at best neglected, often misunderstood and sometimes consciously undermined in their few appearances in the Burlington. There is nothing ‘namby pamby’, in Cust’s phrase, about pastellists from Lenoir to Mengs; but they have been thrown out with the bathwater of the minor figures whose work the Burlington’s early editors excluded.